Home / recipes / ‘Tis the Season for Detox Soup! December is here and we’re so excited about it! We love getting in the holiday spirit especially when it comes to holiday feasting. Holiday parties usually come with endless amounts of pie, mashed potatoes, and cheese plates, and we’re not mad about that. We do however, encourage you to eat as healthy and as simply as possibly when you’re not surrounded by holiday treats. 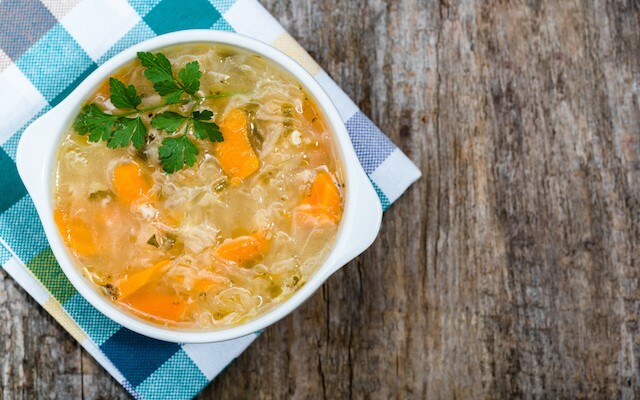 This cabbage detox soup is the ideal meal to make at home when parties aren’t in session. The soup is seriously so easy and quick to make, and it’s loaded with healthy veggies and roots to get your body tight and ready to rock more holiday outifts. (Victoria’s Secret angel wings, anyone?) Plus it’s a total craving-killer since it’s so satisfying! 1. In a large pot (we used a Dutch oven) heat the olive oil for 30 seconds then add in the onions, garlic, one teaspoon of ginger, salt and pepper and sauté for 5 minutes until onions become translucent, stirring occasionally. Make sure not to burn the garlic, so reduce heat if need be. 2. Add in the carrots, celery additional salt and pepper to taste, and cook for another 5 minutes. 3. Add the broth, left over teaspoon of ginger, turmeric, cabbage, and salt and pepper to taste. Bring to a boil, then cover and reduce heat to simmer for 30 minutes. Season with salt and pepper to your liking.